Yesterday I flew out of the United States for the first time in two years. Since then, they’ve replaced all their metal scanners with x-ray backscatter machines. 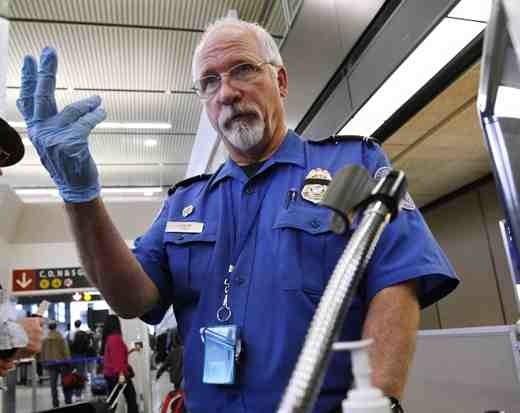 TSA agents were also sporting new uniforms that made them look like policemen. Before arriving at the airport I had decided to opt out of the machine, which has concerned European authorities enough that they’ve banned them outright. Why subject myself to one extra zap of radiation if I don’t have to? That’s what I was worried about. “Here is fine,” I said. He positioned me in front of my bins and said I could keep an eye on them. He told me how the pat down works, adding that he will be moving up around my thighs until he meets “resistance.” He asked if I had any medical accessories like insulin or colostomy bags. I did not. “Okay, sir, raise your hands.” I put them up, just like the people who were walking through the scanner. Then he ironed me. With the flats of his hand he pressed through every inch of my torso. He lifted my shirt slightly and felt around my jean waistline. Then he ironed my legs and the side of my thighs. He didn’t touch my crotch area. Afterwards he wiped a special gauze all over his gloves and put it through a machine. It took five seconds to get the results and then he said I was free to go. I had thought the pat down was going to be similar to how some nightclubs do it, but it was intimate enough that I’m sure the agent knows I’m not skimping on my deadlifts. I passed seven lines out of the security area. Not one other person had opted out. I’m surprised, because it’s such an easy form of civil disobedience. It took about four minutes for my pat down procedure while the x-ray machine takes 15 seconds. If just 10% of flyers opt out, the whole thing shuts down and they’ll have no choice but to stop using them. The fact that most Americans don’t want to be inconvenienced for only four minutes tells me how much they care about having an increasingly authoritarian government. From this point on when I read a story about how the American government is encroaching on our rights, I’ll just think of the masses who just don’t seem to want them. I didn’t even know we could opt out, I hardly ever fly but next time I will. Yeah, they don’t really advertise this fact. I opt out every time, and I fly about 15 times a year. Usually it’s just me or one other person opting out. Sad, isn’t it? I always opt out. Try flying with a kilt on, that tends to make some of the screeners feel awkward! Great minds think alike. I fully intend to wear mine if I ever fly again. Granted, I haven’t set foot on a plane since 2007, and am in no hurry to change that as long as the TSA exists. They just get a chick to do you instead. Its… stimulating. I’m going to start doing that from now on. It’s also what causes ever evil empire to collapse. Spouse flies lots for business. Always opts out. Never had a problem like I’ve read on travel blogs. Thanksgiving weekend is National Opt-Out week just to make the TSA lives a little harder (but not to mention other travelers who only travel once or less a year). Hopefully they’ll shut down the zappers so there are no complaints that make it to the lame-stream media. I always opt out and now my GF does as well. The first time we flew together she tried to give me a hard time until I explained how I am in tech and that tech is never perfect. So, I would rather not go through an imperfect machine that projects radiation at my body.